We began our trip to Oklahoma last Friday… a little earlier than anticipated. Thanks to some great efficiency on our part, after years of packing up for trips to visit family in Texas when we lived in Oklahoma, we got the car loaded long before it was time to pick up the girls from school. So, we did what any responsible parents would do. We went up to the school and signed the girls out two hours early. It was so early, in fact, that Emma met us in the office and said, “I did not even get to eat!” I’m not sure why kindergarten is the last grade level to eat, but it was all good as she ate her lunch while we drove out of Pasadena then Houston with minimal traffic, thanks to the hour. As we do on every trip, we had to stop in Madisonville for a walk through Buccee’s. I still don’t get the thrill of it, y’all. The girls, however, can’t make a trip without visiting that beaver and begging snacks off of us, which they did with gusto this go round. I made the most of the break as well and picked up half a dozen sugar cookies… which I ate within thirty minutes of leaving Buccee’s. I know, I know — we run so we can eat. But this weekend? I didn’t run, so it was inexcusable. And delicious! At this point in the trip, Ana and Emma freaked out when I tried to switch to a different movie, so we had to start the same movie over again. In all, we watched Madagascar 3 FOUR different times on this trip. I can quote parts of it by memory and the Afro Circus song is the soundtrack that plays during all of my dreams. Awesome. This is the glamorous result of interstate travel with children! We called my parents and gave them our ETA, arranging to meet with them in Waxahachie for dinner… where we arrived late because Ana had to go to the restroom ten minutes away from our meeting spot, we missed the exit for the restaurant, and we overshot the exit and had to circle back around TWICE. Glory. We did eventually arrive at the restaurant, where we ate and sent the girls off with my parents for the last forty miles of the journey to Alvarado, where we spent the night. 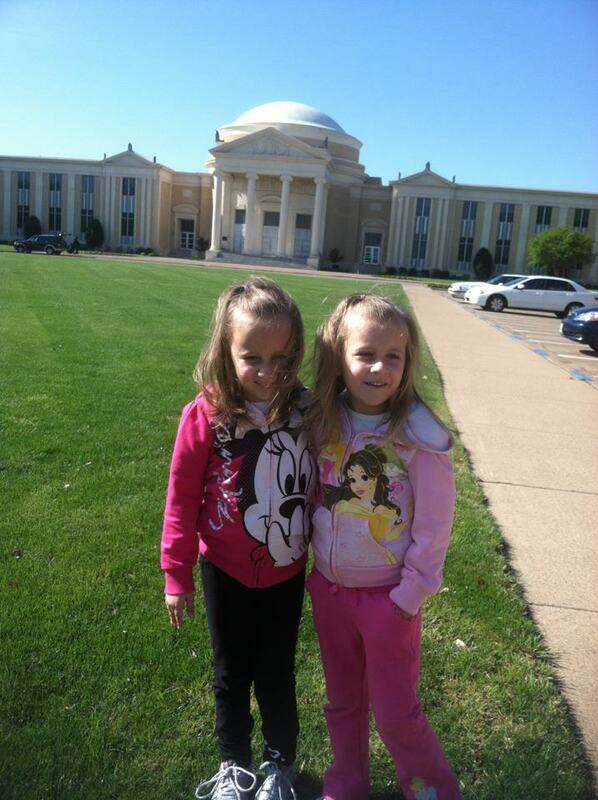 Anyway, once we got there, we decided to take the girls on a walking tour of the campus. They freaked out when they saw all the hunting trophies in the Student Center (as did I), went crazy over the bridge and koi pond, and read every single verse on the walk to the chapel. Emma declared that she now plans on going to seminary and becoming a missionary, a declaration that prompted Ana to so bluntly say, “You’re not a Christian.” And to which Emma answered, “I know, Ana. I am a MISSIONARY!” I predict that she’ll win herself to the Lord in no time at all. Awesome! The girls loved the tour. And we loved imagining them here in another twenty years, studying and learning how to best serve Christ wherever He leads them. Wouldn’t that be awesome? Since we were feeling nostalgic already, we went and had lunch at Rosa’s, where we ate practically every day during our last year in Fort Worth. It was still just as great… maybe even better, since we’d gone without it for so long! Then, we were back on the road to Oklahoma. We listened to our Four Parks-One World CD on the drive, and I’m ashamed to tell you that I have EVERY WORD memorized. This made for a more entertaining trip for everyone else in the car, I’m sure. Once we arrived in Duncan, Ana proclaimed, “Everything looks… not familiar.” I guess I was expecting the girls to remember more than they did, but they looked so confused, even when we saw the church and our old house. They didn’t even recognize Wal Mart, which we probably spent more time in than either the church or our old house. Eh. We met up with some wonderful friends for dinner and ate ourselves into a stupor, basically. I’m not sure where our appetites had been hiding, but they came out in full force this weekend. After sitting around and visiting for a long while, we headed back to our hotel, where we went down to the pool so Ana could practice for next week’s baptism. I won’t bore you with a description of the wailing and gnashing of teeth that took place. It’s enough to simply say this — it was bad. Ana is scared of putting her head underwater, which is an unfortunate thing when you want to be baptized. Emma showed Ana how easy it was by going underwater herself, then proclaiming, “I bab-a-tiz-ded myself!” Already a missionary — converting, baptizing, and likely soon discipling herself. Awesome. Ana did finally get brave enough, after many tear-filled, loud pleas to Jesus to “make me BRAVE, Jesus, PLEASE!” and got dunked five separate times by Wes. Then, she dunked him ten times. And I dunked him two more, just for good measure. Stay redeemed, Pastor! I think all the bab-a-tiz-ing in the pool will save us all from some screeching and panic in the church this Sunday. Pray with me that it does, friends. Up next… the 50th Anniversary Celebration!